He followed us to part of the Bosque where dogs aren’t allowed - the highest point of the forest. He was very sneaky. So we put leaves on his head and pretended he wasn’t there too. Last year we wrote about planting nopales - a cactus with edible pads (leaves). We brought in three truckloads of nopales last year, dumping them in three different locations and then dispersing the pads across the forest. For the pads that seemed dead, we just left where we had dumped them. We have six types of nopales. Most are edible. Some produce pricky pears (tunas in Spanish); a sweet, nutritious fruit. In about 2 years we will be able to eat as many nopales as we can handle. They are a great plant for our style of agriculture; no irrigation needed and they’ll last forever. Nopales are a great addition to the diet here - a superfood containing lots of great nutrients. Kuya came to us from British Columbia, Canada, originally from Japan. Kuya spent about 4 weeks with us, allowing us to get to know him for the gentle, productive, and very intelligent person that he is. 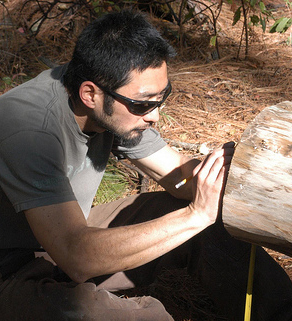 Kuya is an amazing carpenter, and is interested in rustic furniture. Among the many contributions he made while he volunteered with us, Kuya created a fantastic bench and helped us to complete some of our unfinished furniture. He also carved a face in one of our totem poles. In addition, he helped us start our initial attempts to translate the Bosque Village website into Japanese. Kuya can be elegant with a chainsaw, was a pleasure to work with, a joy to chat with, and we miss having him around the fires at night. As we passed our first year of hosting volunteers, we spent some time going over who has visited us, how they contributed, and what we learned from each person and what they were able to learn here at the Bosque. Over the next month or so we will be writing up volunteer spotlights about some of the volunteers who have taken some time to visit us and contribute and participate in the Bosque Village project. We will also be writing up a year report of what we have learned as we hosted volunteers. We hope the report will help future volunteers understand more about our program, and also help other communities learn from our successes and mistakes. So, the Volunteer Spotlight series will begin today, and likely last a long time. Many volunteers come through (58 in the past year), and a certain percentage go above and beyond in helping us: they bring new ideas, hard working attitudes, leadership, and initiative to the project. Without our volunteers, The Bosque Village would not be the vibrant, exciting, and constantly evolving project that it is becoming. Save the seeds! Guardar las semillas! At the Bosque you will see signs reminding you to save the seeds from your food. Next to the sign, a small tray collects peach, nectarine, and plum pits, and various seeds including apples, oranges, limes, and peppers. The percentage of our seeds that are bought from seed companies is very low. From a company in Pátzcuaro we purchase seeds to grow tomatoes, greens, onions, leeks, carrots, beets, and an assortmant of other random crops including enough parsley to season about 5 million meals. Our main methods to acquire seeds include purchasing local fruits, roadside and Bosque seed collection, and shopping in the large mercado de abastos in Morelia. For anyone who is familiar with their area (or who desires to gain familiarity), acquiring seeds is easy and fun! The Spanish word used in this area to describe fruits and vegetables that are native is criollo. When we do our shopping we ask the vendors to point out foods that grow in this area. With a criollo apple, we can save the seeds and plant them, growing a tree that is used to this climate. If we desire, later on in the life of the tree we can graft on a non-native apple which will flourish growing on the native rootstock. Below is a native tree that was grafted this year - it has already produced fruit! When criollo avocados are in season we generally buy them by the box. We pig out on avocados and then we plant the pit, growing native avocado trees. The native avocado tastes a bit milder than the Hass avocado most foreigners are accustomed to (produced in mass in this area for its flavor and ease of shipping). The criollos have a very thin skin that is a bit difficult to remove from the fruit. We will keep some of the native trees the way they are, and with others we will graft on pieces of our Hass variety of avocado, and perhaps other varieties that we can come across from the neighboring avocado farmers. Criollo seeds are not the only seeds we save. Even though non-native fruits are much less likely to flourish and produce yield, we still save the seeds and try them out anyway. Some of the peaches and plums we buy are from grafted trees. Most of the pits that we plant will produce an inferior tree variety, but some will be far superior! Because we have lots of space to play with different means of plant propagation, we save seeds from most of our produce to try them out in the Bosque. Anyone driving along with Brian will be a bit surprised when he quickly stops and pulls over to the side of the road. Just look up! You’ll probably see an ash tree, a coraline, a cedar, or some other plant that is producing seeds. We often keep our eyes out for trees, bushes, and vines full of seed pods. If the seed doesn’t germinate, it’s likely good for making beads or other crafts. We keep cutters and bags in the van for such occasions. We also are always on the look-out for plants in the Bosque that are producing seeds. 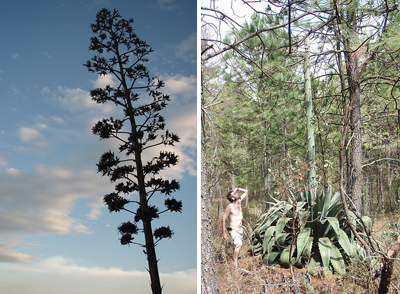 Below, left, is a maguey flowering. Below, right: there is a maguey near Cute Hill that will flower very soon. 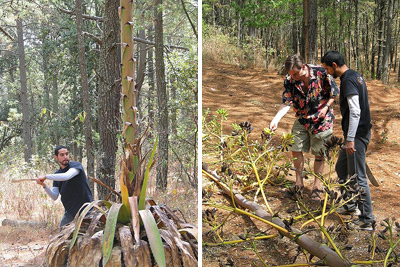 Below (left) Rodrigo is chopping down the stem of a maguey plant. You can’t tell, but he is being rained on - by seeds - as he chops it down with a machete. 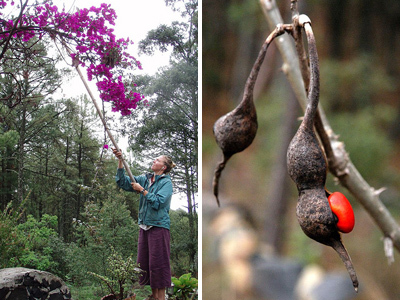 Below (right) Brian and Rodrigo are collecting seeds from the pods in the plant’s flower. We also collect flower seeds, vegetable seeds, and small baby plants. One of our aloe veras in the barranca (ravine) just produced three small baby plants that we will let grow for another year, then move to another location. In Morelia, there is a large wholesale market called mercado de abastos (supply market). This market is the third largest supplies market in Mexico. Truckloads of oranges, onions, dried goods, and other goods are brought to this central market for redistribution to the vendors who sell goods in the local markets. We are fortunate to live in a state that produces most of its produce, from bananas and mangoes to beets and greens. Before big groups arrive we generally drive to Morelia to pick up boxes of tomatoes and bags of oranges, along with tons of other produce. We also make two to three runs to the market for dried goods every year. We made one last week, purchasing bags of oats, beans, and rice to get us through until late Autumn. We also bought loads of seeds! From wholesale providers we purchased kilos of walnuts, pine nuts, pecans, macadamias, cumin, sesame seed, nutmeg, popcorn and other corn varieties, birdseed, and more. Below is our favorite dried good vendor at the mercado, and also where we bought this year’s supply of corn, flax, and sesame seeds. We will try each of the seeds in planting beds, gardens in the forest, and pots to see what can survive here, how much water it takes to keep the plants alive, and whether or not growing the plant is a productive use of our resources and time. The birdseed will be planted in gardens, growing grasses that will produce more seeds to attract birds. We are hoping that the pine nut trees will do well here, since pine trees do grow in this area quite well. Chilino assures us popcorn will grow, which will be fun to dry and try to use! All together we have eight types of corn to plant this year. Walnuts, pecans, and macadamia will all do fine here, though we are not sure if macadamia trees will produce fruit unless there is significant climate change. 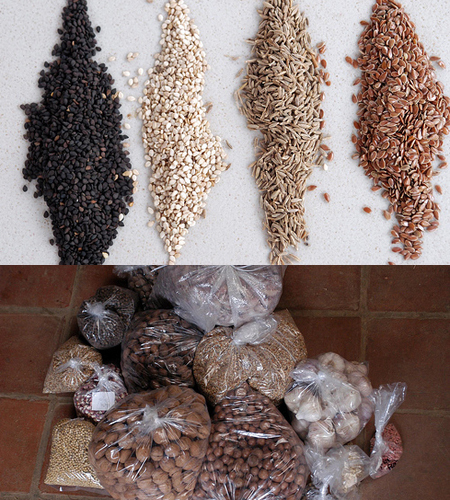 Rather than purchasing from a seed vendor a small packet of walnut or corn seeds, we find that buying by the kilo at a large wholesale market is much more economical, and likely more local. Sometimes it’s hard for people who visit us to understand what we are doing agriculturally. The nut trees we are planting today won’t fruit for at least 20 years, making gratification delayed, to say the least. The piñon we are planting (pine nut tree) will not produce nuts for over a hundred years! But generations down the line, when the current residents are far gone, we hope that a community will enjoy the results of the seeds we are planting this week. And a few years from now we will be enjoying at least some of the fruits of our labor, with both a forest that is more diverse and fruits from trees that are quicker to produce. What we can eat from the food forest today: avocados, peaches, plums, mandarins, pomogranates. And in five years: oranges, limes, grapefruits, figs, quince, pears, guayaba. And in twenty five years: walnuts, pecans. And in one hundred years: pine nuts! You are currently browsing the News and thoughts from the Bosque Village weblog archives for June, 2009. Entries (RSS) and Comments (RSS). 18 queries. 0.143 seconds.